4 out of 5 based on 28 ratings. This epic work of historical fiction chronicles the French Emperor Napoleon’s invasion of Russia in the early 1800s. 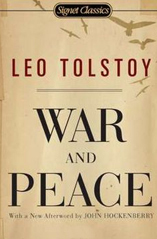 Widely considered to be one of the greatest books ever written, it is extraordinarily detailed and complex. The reader is introduced to the events leading up to the invasion through the eyes of five prominent families of the Russian aristocracy, introduced at a dinner party in St. Petersburg. The year is 1805, and war is brewing in Western Europe, as Napoleon conquers countries one after the other. The fear among the aristocracy is growing, and the interplay among the noble families is as much a theme of the novel as the historical setting of the war. Take a stroll back in time and relive notable events that have evolved the world to what it is today. History buffs over the years have devoted their time to discovering the different angles that have been brought up by the past. Browse through Freebooks.com to uncover all of the mysteries, truths and actualities, and revive history’s greatest stories. History books rehash past events to enlighten readers the details of what took place in a certain amount of time. It can explain a particular time period, era, describe a particular people, events happening in different countries, wars, political matters, past catastrophes such as the holocaust, 9/11 tragedy, and other historic affairs. These history stories can come in forms of fiction or non-fiction, taken in a place of a different time period, invented plotlines to real-life events. History buffs can read free online novels downloaded straight to the computer or e-reader instantly. Freebooks.com is a library filled with a copious amount of e-books to choose from, available in many genres.